As 2013 comes to a close BN interviewed the JCC�s new president early December at �Haroun & Haroun Law Office�. This is what Magda Haroun had to say. Q. What have you accomplished since you took over the JCC presidency last April following the passing of Carmen Weinstein. A. Changeover periods are never easy. Many pending issues still remain unresolved. Understandably, my first priority was the well-being of the remaining members of our small community. In view of their advanced age most of the problems are health-related. Two of our senior members needed immediate attention. One is now a resident in the Italian Hospital geriatric ward and the other is under observation in another medical center. Q. Were you able to sort out pending legal matters especially since the former JCC lawyer became an outright adversary refusing to cooperate? A. Legal problems are never solved overnight. Thankfully our firm�s legal background proved to be very useful. To date I am still in the process of evaluating various assets belonging to the community which is no easy matter since titles and deeds are either missing or held up in various court actions. The process promises to be a long one. The fact that former legal counsel chose not to cooperate is making my work even more difficult that it should be. There were many very unpleasant surprises and I expect more to crop up as I dig deeper into the JCC�s legal and financial affairs. Q. What is the current financial condition of the JCC? Do you have sufficient funds to maintain the synagogues, the Bassatine Cemetery and more importantly the welfare of the JCC community members? A. Unfortunately our financial situation is very bad. Most of the JCC�s bank accounts were depleted especially during the last months of the previous presidency. I suspect that as Carmen Weinstein�s health condition took a turn for the worse those in a position of trust took full advantage of her precarious situation. The lambs turned into wolves and drained the reserves so to speak. I am still trying to trace the money trail, which is no easy task given the non-cooperation of former counsel. The reason is obvious. Q. 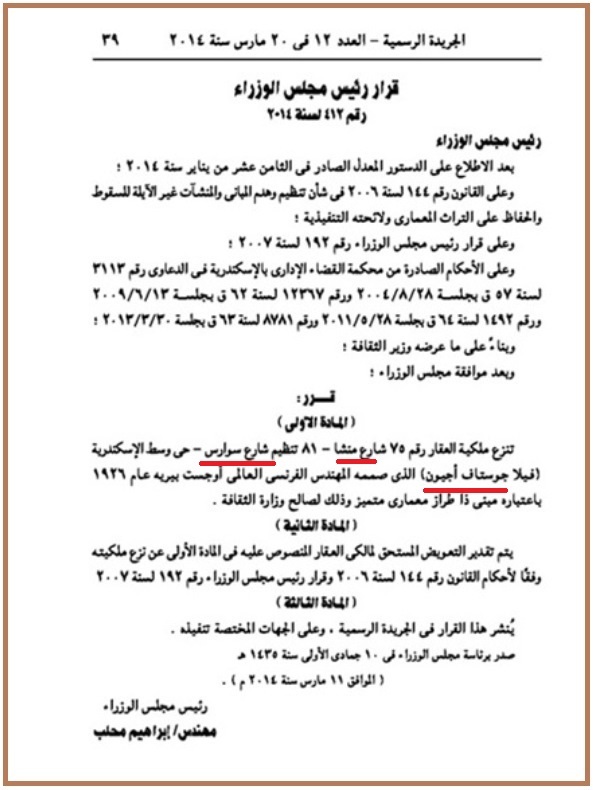 Besides the paper chase was there time for other activities concerning the JCC�s communal and religious activities? 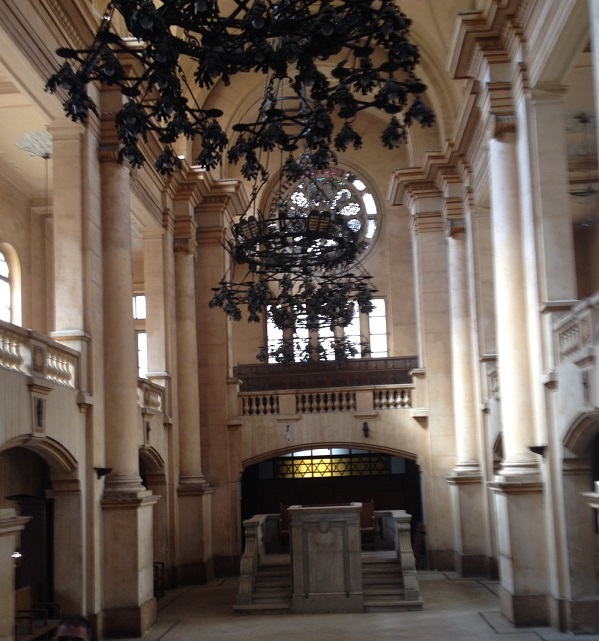 A. I am happy to report the Maadi Synagogue is once again in functioning order. 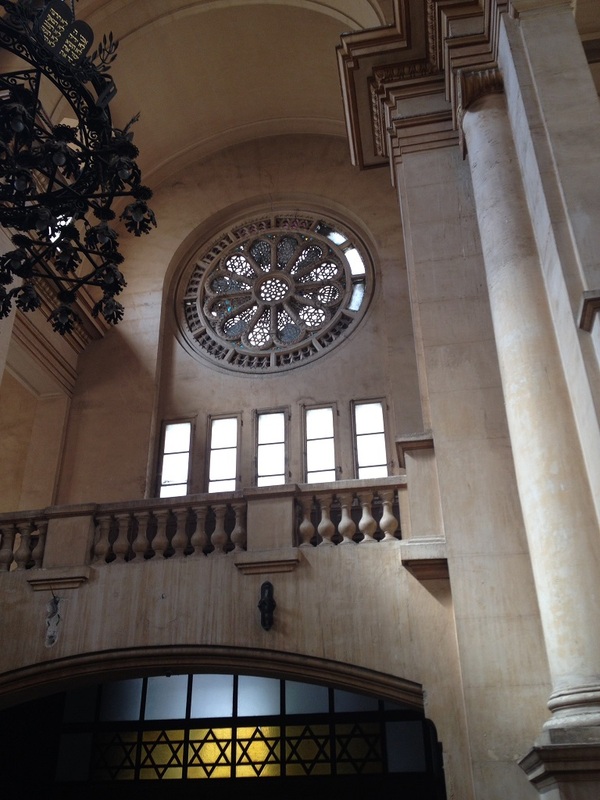 It was totally revitalized during summer and is now open to worshippers seven days a week. Our caretaker-guard Metwalli is in charge of upkeep and has explicit instructions not to impede worshippers from visiting. The garden, which had been separated from the Biton Temple by a brick wall, was re-integrated with the main building. It should be tidied and re-planted in 2014, this way we can hold many High Holidays therein. As for Bassatine Cemetery, it is in advance state of disrepair. In view of its size it needs considerable sums for both its upkeep and general security. And since money is currently unavailable all that remains is for us to pray that it shall still be around once we resolve this crucial financial issue. Q. 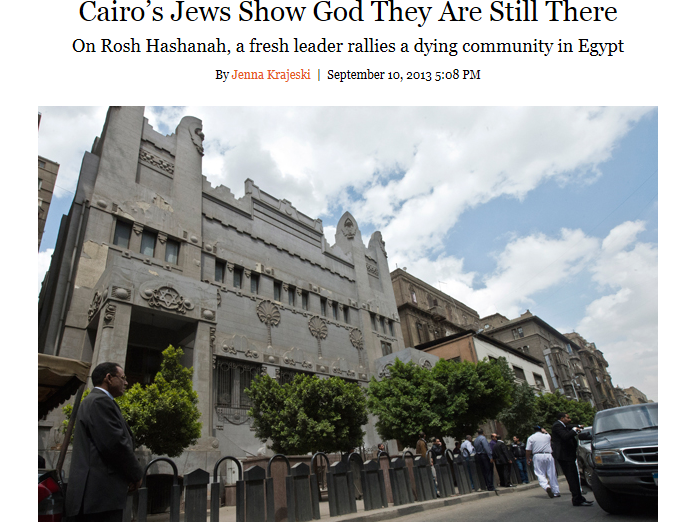 The press claims Shaar Hashamayim Synagogue on Adly Street is in poor condition. Is that correct? A. This would not be the first time the press gives out inaccurate information. 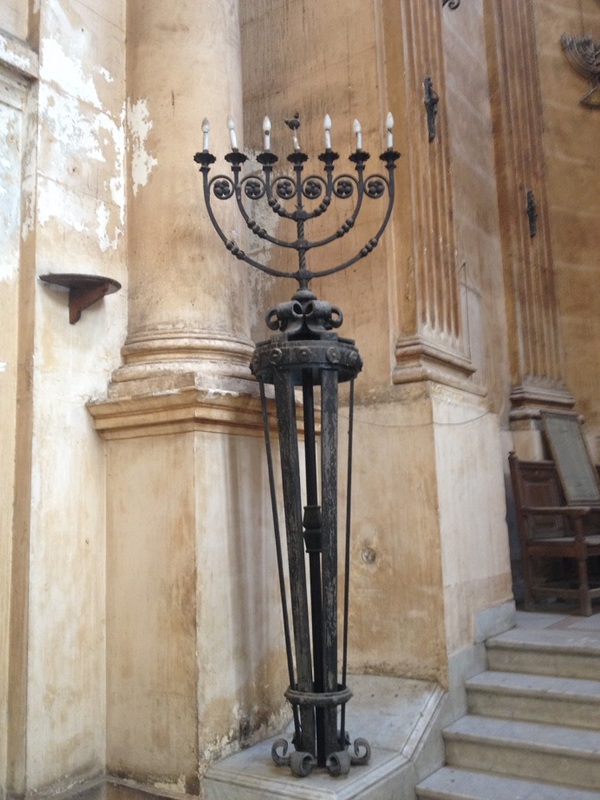 Shaar Hashamayim is in fine shape and I�m pleased to report that last week we celebrated Hanukah, lit the traditional candles and blew the new shofar recently imported from Cyprus. Shaar Hashamayim never looked better. Our next High Holiday is scheduled for February 2014. We hope that by then the political situation will have cleared up so that we can celebrate Purim with pomp and ceremony evidencing that our community is still alive and well. 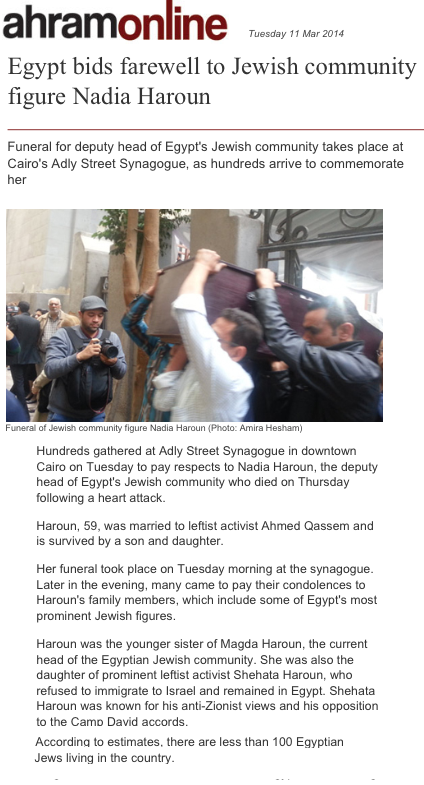 But my greatest achievement to date regarding Cairo�s synagogues is that they are now three instead of two. 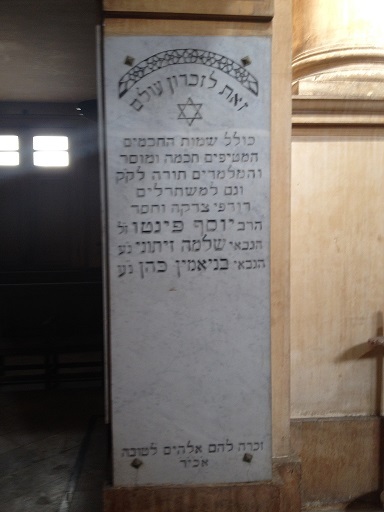 Besides the Maadi and Adly synagogues, the charming Vitalis Madjar Temple founded in 1924 in the presence of Rabbi Aaron Ben Simon, has been rehabilitated last month. 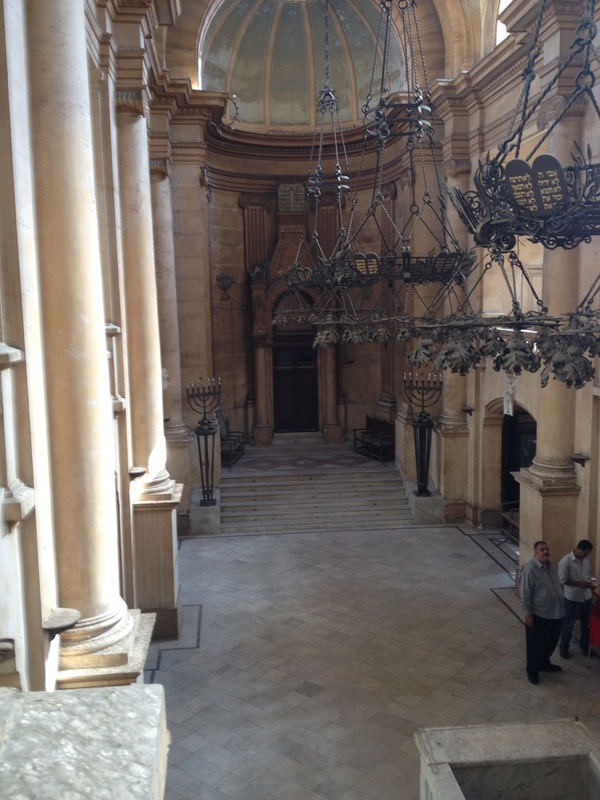 I invite BN to publish the pictures taken recently of this forgotten Heliopolis jewel. 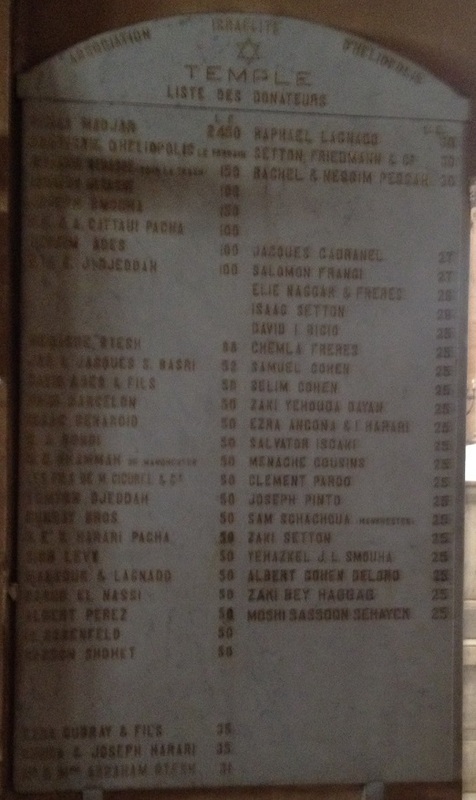 As for the historic Ben Ezra Synagogue, it is still one of the most visited landmarks in the district of Old Cairo. Incidentally, the Vitalis Madjar Temple is often referred to as the Btesh (Betesh) Synagogue. 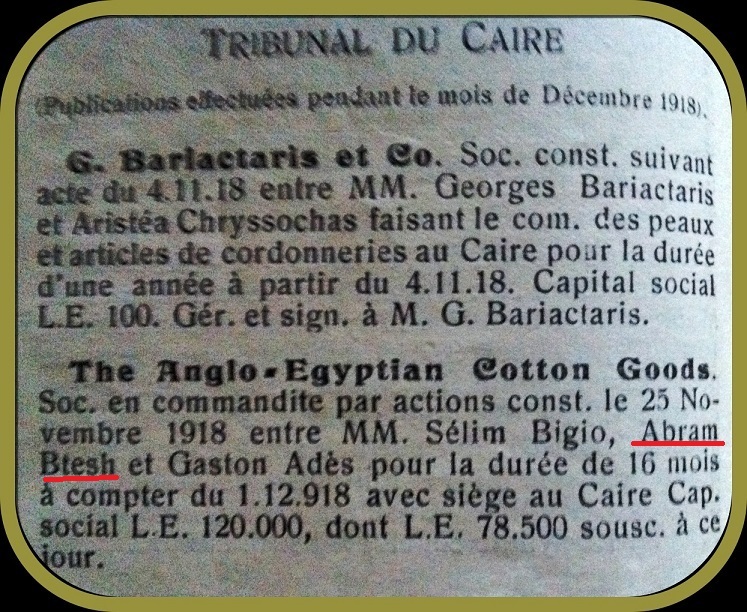 This is because it stands adjacent to the Abram Btesh Jewish community school founded in 1928 by Abram Btesh of the Anglo-Egyptian Cotton Company. The suspect sale of the school building several years ago was the subject of ongoing litigation which earned the former JCC president considerable bad press in 2010-11. Q. What about local and international feedback regarding your election as head of the JCC? Are you getting the required support? A. Absolutely! In summer I was in the United States attending a world Jewish forum waving the Egyptian flag. I hope to repeat this visit so as to keep the momentum going. 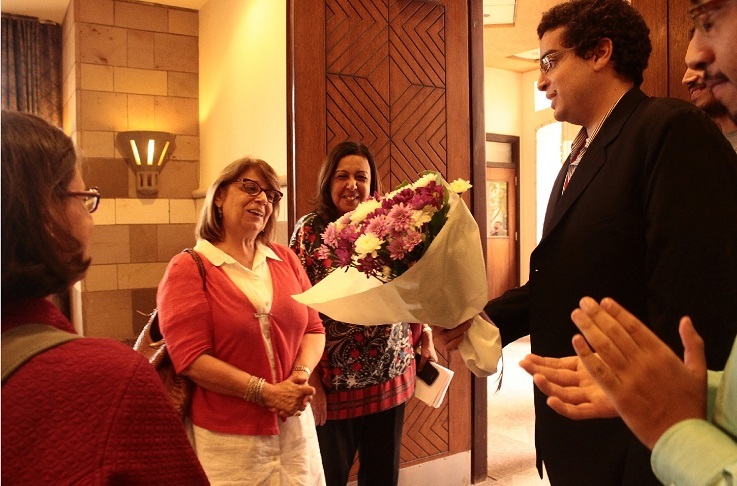 In Cairo meanwhile I was on several talk-shows expressing my views freely. The press also gave me a lot of space. And now, as we speak, movie director Amir Ramses is filming part II of his box office success �The Jews of Egypt.� Last week he was recording at the Adly Synagogue interviewing several elders of our community. He will be doing more of the same during the coming weeks. Naturally I wish him all the success for bringing our history and present dilemma to the attention of the general public. Situated in a smart downtown redbrick Italianate building built by the Gategno family during the interwar period (1930s), the Haroun office is one of a kind. It's as though time stood still. Once inside you cannot help but sense the days of the Mixed Courts, when lawyers of various nationalities pleaded their case in front of distinguished Egyptian and international judges dressed in formal attire sporting the famous tarbush, which indicated its wearer was of the educated effendi and bey class. Magda and her sister Nadia kept it the way it was during the days when their father, the late Maitre Shehata Haroun, was one of the city�s most respected lawyers. His corner office is now occupied by Nadia and is overloaded with files and legal references in French and Arabic reminding us that for almost two centuries Egypt's legal system followed the code Napoleon. Today, as though reflecting changing times, the Haroun sisters are mainly concerned with contract law and copyrights. Their fax machines, laptops and I-pads are incongruous in the wood and cane surroundings. Here and there you espy mementos of the past such as an old Remington typewriter and what is now regarded a prehistoric rotary telephone exchange. This m�lange only adds to the charm of the place. A perfect setting for a �Law & Order� TV series! 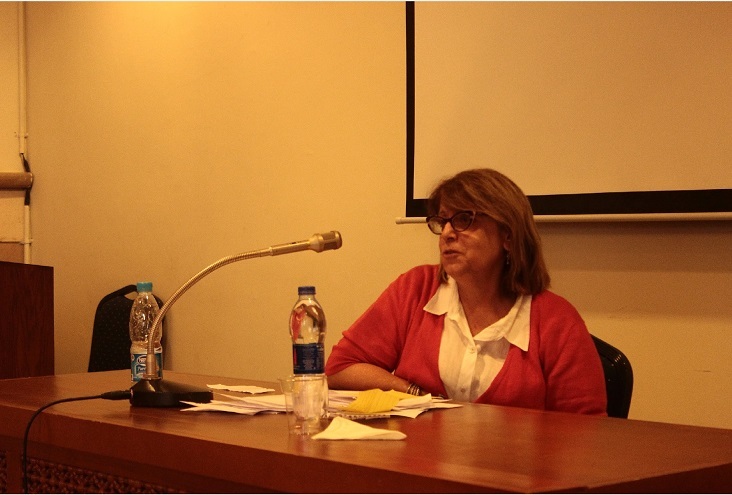 Invited last November by the American University Cairo's (AUC) History Department to give a talk about the JCC's activities and what it means to be a Jew in Cairo, JCC president Magda Haroun obliged with a fascinating lecture followed by a rewarding question and answer session. 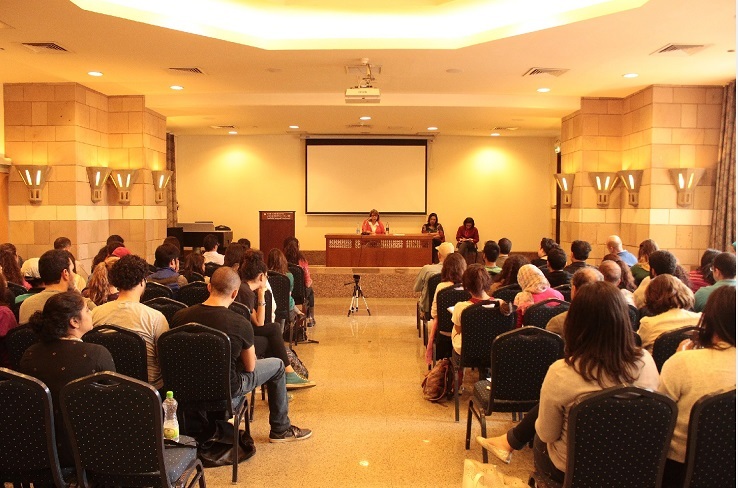 For the past several years AUC students have visited Shaar Hashamayim learning first hand about Egypt's Jewish history both past and present.